Employers know that happy workers are more engaged, productive and likely to stay, but many business leaders are unwilling to make it a priority—at the peril of the bottom line. What constitutes a company’s culture? It’s a stew with ingredients such as communications, compensation, benefits and engagement, attitude and ethos. An organization’s culture might be an abstract asset (or liability), but it has a significant effect on the bottom line. SnackNation has conducted research to gain more understanding about what contributes to a positive, productive culture and to gauge how American workers feel about their workplace’s culture. It found 10 key insights, starting on an upbeat note. 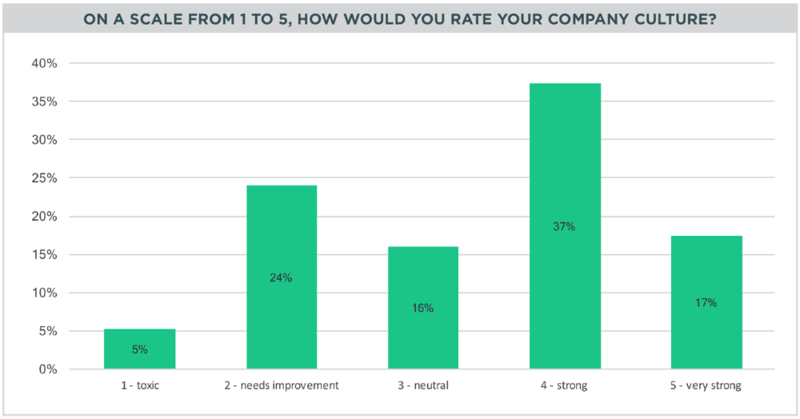 Eighty-three percent of respondents said their company offers plenty of opportunities to grow and advance. Just 28 percent reported having no growth opportunities at work. Seventy-one percent reported being either “happy” or “very happy” at their current gig. Not all the news was rosy, however. Twenty-nine percent of the survey’s respondents said their company culture was either “toxic” or “needing improvement.” Almost 90 percent affirmed that flexible scheduling was a crucial benefit, yet only 46 percent reported having access to this perk. As for recognition, 36 percent of respondents said they receive feedback on their work either only once a year or not at all. Most companies would agree—at least in theory—that culture is important. It plays a key role in employee engagement, retention, recruiting and productivity, and yet leaders are often skeptical about investing in this nebulous yet crucial business element. If your leaders need convincing, SnackNation’s research may help build the case for making culture a priority.